H. P. Lovecraft; quite easily considered to be one of the most brilliant and creative horror and mystery writers of all time. His morbidly fascinating universes, brilliant characters and creatures, and suspenseful display within will cause any reader to be instantly captivated into a new world. Howard Phillips Lovecraft was born on the 20th of August, 1890 in Providence, Rhode Island, to Winfield Scott Lovecraft and Sarah Susan Phillips. When Lovecraft was only three years old, his father was admitted into a psychiatric hospital, where he died of “general paralysis of the insane,” leaving his son in care of his mother and his two aunts, who constantly kept him away from much of society while also frequently tormenting him, claiming that he was ugly. 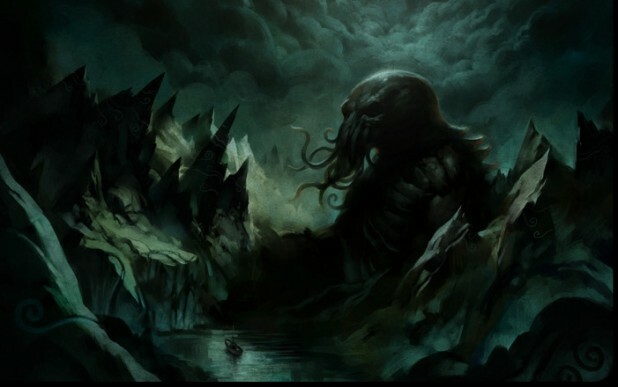 Lovecraft learned to read at the young age of four, and began to read mainly into mythology and folklore. His grandfather introduced him to most of these things, from which many of the author’s stunning tales originated. As Lovecraft matured, he found that he preferred the company of adults rather than children his own age. His reserved nature lead him to create his own worlds with his writing, rather than playing games with others. At the age of fifteen, Lovecraft published his first horror story, “The Beast in the Cave.” By 1914, he had submitted a series of articles to the Amateur Press Association, as well as many newspapers, ranging from stories on philosophy to the occult. It was not until 1917 that the young author began to seriously consider writing for a living. He and his family had been forced to move from his birthplace due to severe financial issues. (Later, he was to spend much of his life poor, living on as little as fifteen dollars per week.) His mother’s health diminished from there, until she was taken to stay at the Butler Hospital in 1919, until she died in 1921. On March 3rd, 1924, Lovecraft betrothed Sonia H. Greene, however their new life proved too much for him after only two years, and they went their separate ways. The urban life in New York was not to the author’s taste, and his extreme distaste for the city became inspiration for the story, The Horror at Red Hook. After the divorce, Lovecraft returned to his birthplace in Rhode Island, and stayed in the house of his surviving aunt, Anne Phillips Gamwell, while still traveling frequently to visit other parts of the country, including historical expeditions to New England. He remained in his home state for the rest of his life. Users’ Manual: Obey The Rules. Consult The Guide. Have fun! Happy July! There’s a solar-powered plane flying across the Pacific right now as part of a larger round-the-world flight and you can follow their progress live– they’re 66% of the way to Hawaii! Look up “Solar Impulse”! They just landed! Woo! Next stop, Phoenix, AZ after a few days for repairs! @Huntress Wizard on the last thread: SUMMER@BROWN. AHHH. I go to Brown and I am so envious you get to be on campus right now I miss it so much. How’s the program?? It’s fantastic! A lot of work for sure, though: it’s only been a few days and my stack of flashcards is already pretty thick, ha ha ha. But I do like that there aren’t any grades or anything, it’s purely to learn. The labs are cool too: I’m used to chemistry labs, so it’s fun to be able to look at organisms and write about them instead of chemical equations and reactions. Yesterday we learned about cnidarians, so in the lab we looked at moon jellies and a type of sea anemone. You go to Brown??? That’s so cool! I really love it here: I just found the V-Dub yesterday (it’s right near my class but I couldn’t find the door), and the food is amazing! Yeah, I’m going to be a senior in the fall, which is absolutely nuts. I haven’t done much in the sciences but most of my friends are science concentrators and love it. Glad you like the V-Dub; it’s better than the Ratty 100% for sure. If Jo’s is open during the summer you should go and get a quesadilla. Also I’m pretty sure ThanksForAllTheFish42 goes to Brown too now?? But he hasn’t been around here in ages and ages. I asked my RA and she agreed that Jo’s was really good but said it wasn’t open during the summer. GCA-DS on last thread: My mum did something similar a few times, that I remember off the top of my head. (I dealt with it by being even more emotionally withdrawn for a while. Yeah.) It doesn’t look like there’s anything you can do. I hope she feels better soon. She almost killed herself yesterday night… If it weren’t for me and her other friend, she would have done it… There is a gun in her house and she knows where it is… I really don’t want to loose her. Oh dear… Could you call a hotline or child protective services or something? You should, GCA-DS. If your friend is eyeing her parents’ gun, they should know about it. The interesting fact between H. P. Lovecraft and I is that I can relate to his instances of ‘automatic writing’ somewhat. A few weeks ago I was so overcome with energy and power from a concert that I was watching on television, that as soon as it was over, I rushed to my laptop and typed out everything that I felt and did during the show. It’s actually quite similar to insanity and overreaction to be honest, and I’m still not sure how I reacted so violently. But still, the need to preserve that feeling of energy drove me to write, and the whole time I was thinking of Lovecraft’s story. Yeah this is dumb information, I’ll just go hide now. Some movies inspire me to write. Sometimes just commercials for movies will cause me to want to start writing. XD it was at camp a few months ago, we went to the movies and an commercial for Hotel Transylvania 2 came on and made me want badly to write my own story. Unfortunately, I was at camp and had no pencil and paper. Is it too much a pice of blatant wish fulfillment to have Steve Irwin alive in the present in a Jurassic Park fic and justify it with “butterfly causes hurricane, and the JP timeline diverged from ours in the 1980s if not before”? In alternate-history scenarios, I’d say anything goes. I’ve been keeping a journal for a while now, to write in whenever I feel like. It’s remarkably helpful for clarity of mind; when I’m trying to get all my worries or my ideas laid out on the page, I get them sorted out in my head as well, and my thoughts and feelings are no longer an indistinguishable morass. I’ve been keeping it in a Google Document; I feel a little guilty for not using any of the many mostly-blank journals people gifted me over the years upon hearing I liked writing. But typing is so much faster than handwriting for me. I usually save the journals for camping trips and the like where I won’t have internet or electricity. I’ve just committed to journaling for the umpteenth time (I get a new journal every year and make it about three pages in). You’re right, it’s amazing for sorting out emotional morasses. I’ve been trying to imagine what future me will want to remember about current me, and writing that– it feels kind of like a very self-centered anthropological project. I’d be interested to know about other people’s journaling styles! Do you write them like letters to your journal, or do bullet points or draw pictures or anything? My entries right now are a mix of to-do lists and angst. My journal is just a document titled JOURNAL in all caps. I keep to-do lists separate — but it might be a good idea to keep them in my journal, too, so there’s a record of what I’ve already accomplished instead of a constantly updating, single list. Some things feel more real when you write them by hand vs on the computer. It’s up to you whether that’s a good thing or not. Anyway I have a lot of thoughts about journaling because for the past few nights, inspired by POSOC, I’ve been reading through the electronic journal I kept. It’s been a trip, alternately touching and cringeworthy. What I’ve found most interesting is that my mental illness, which I had previously thought of as coming on out of nowhere in winter 2010, now appears to me as clearly foreshadowed and fairly obvious to pick out, even in 2008. Fancy journals seem intimidating to me, as if you should write something Worthy. I filled a few years’ worth of single-subject notebooks that I’d buy in quantity during back-to-school sales when they cost only 25¢ each. Recently I started using Notes Plus, an iOS app that gives me best of both worlds. I can write longhand, and the app converts it to type. I just finished reading Lynda Barry’s book Syllabus and I’ve been experimenting with the journaling style she teaches her students. I can’t do a good description here not least because I’m typing on my iPod, but I’m a huge fan. oh man! we read some of her books in my Graphic Novels class, my instructor was buddies with her and they traded works between classes sometimes. I liked it a lot in concept but I’m absolutely terrible at keeping a journal. Museblog was pretty much my diary growing up. Now here as well as an External Blogging Site fill that mostly. I guess I tend to overshare on the internet and undershare in person as a general trend in my life. My journal is in a black moleskine notebook (yeah, im so classy B)). It’s very disorganized, but I always make sure to write the date at the top of the entry. Lately I’ve just been writing down interesting things that happen to me and thoughts & ideas that occur to me. Also often in my journal are lists (of movies to see, things i want, things to do, things i want to do, etc. ), randomness and awful irrelevant doodles from when im procrastinating, and occasional 3-page entries about how I feel (my emotions, oh yeah. such diary). I do feel kind of guilty filling up my fancy pants black leather books with complete randmness but I like the plain blackness of the books and how it feels to write in them. I’ve written in journals every day since 2003, with a bit of a break in 2013 or so but now I’m back at it. The first two journals were not quite like the ones that are now my standard. The first one was some small black suede one from Barnes and Noble. I liked it because it was black and chunky. Then I got a nice green cloth one for my birthday so I wrote in that for a year. Now I use spiral bound book journals, namely, these people in Washington turn old books into journals and I use those. I write about my life, weird thoughts, to do lists, other lists, sometimes poems (though I mostly put those in writing notebooks). Dreams, thoughts about the future, rants about my day, thoughts about my friends. It is very fun to look back and see glimpses of past-me. I can rarely keep physical journals, but I find it therapeutic to have a private microblogging account (it’s secure; no one can see it but me) and I send out dispatches there regularly. it resembles a diary, but split up into tiny private microcoblogging fragments. I’ve kept semi-regular journals since I was about 10, so there’s a good amount of my life documented. I used to joke that I kept them just to remember what I’d done, but that’s actually a really important function of them, because I’ve always been somewhat forgetful, and I’ve had periods of pretty alarming memory loss that journalling helped salvage a bit. Of course, it’s all terribly embarrassing or amusing (sometimes both) to read through the old entries. I always organized my journals separately than my notebooks though, my journals are collections of very factual “this is what I did today” entries with emotional commentary, and my notebooks were inspired by Harriet the Spy, so they were filled with sketches, story ideas, life observations, to-do lists, addresses, book recommendations, and provided paper that I tore out for letters. I used to always carry both my journal, my notebook (always sticker-bedecked composition notebooks), and at least two books I was reading everywhere I went (one fiction, one non-fiction). Obviously, I was a Cool Kid back in the day. I also have a handful of digital journal-esque entries, mostly in Evernote. There’s also my posts here and on other social media sites, that I sometimes feel like are an extension of my private journaling. I’m confused — how do you know it works? I’m sure you won’t believe me because nobody would even though I’m telling the truth, but she told me it worked and even sent me videos of herself trying to talk and not being able to which really scared me. was curious, so I went and found the youtube video and tried it. It didn’t work for me – can still talk just fine*. The first part felt nice and relaxing, though, even though I don’t think I actually fell asleep / went into a trance or anything. Overall, waste of 8 minutes. I suspect a lot of the people saying it worked were either exaggerating the effects or really really wanted it to work and so were more suggestible. *my vocal chords work as normal. The content of my speech remains suspect. Hm, how do you undo a Silencio spell? Finite Incatatem? That should have been made the undo word. Fun fact; hypnoses can be and was actually considered magic for the longest time. Nowadays we just call it ‘science’. It’ll be interesting to take an computerized standardized test (or really, any sort of standardized test at all) after years without either one. Good luck! Try to do at least one prep section for English and one for Math in your book before the test, it will boost your confidence greatly. favorite thing about music school: didn’t need the GRE. Haven’t taken a standardized test since my last AP. Take that, College Board! Has anyone else here read the Dinotopia books? I just re-read the first book (Dinotopia: A Land Apart From Time) and the second one, The World Beneath this week. Holy cake is the art beautiful and the worldbuilding is amazing. AGES ago, but yes. Deliciously weird stuff. I’ve been meaning to check this out from the library again. James Gurney has a fantastic art blog too! Gurney Journey. He also spent a year hopping trains in the South West with Thomas Kinkaid. I have missed the boat on Dinotopia somehow! Thanks for alerting me. They sound great. Have people seen the (supposedly fake) Lemony Snicket trailer? It’s really well done, and Netflix denying it being real feels like something that they could be doing to match the show. I myself have been secretly hoping that the show will be directed by Wes Anderson. But yes, that was a well done trailer, although I have some slight reservations about making the books into a show for the reason that the tongue-in-cheek style of the books won’t transfer into television, and simply be vaguely darkly humorous and quite possibly simply depressing. I’m moving to a bigger apartment! My new apartment will have two rooms instead of just one, as well as better amenities, such as an oven. I’m gonna make challah! Only place at the zoo not overrun by parents and children: directly in front of the mating dwarf mongooses. XD I went to the zoo last Saturday and the adult with me had to pull me and the rest of my group away from the cage because the little critters(I forgot which ones, but they were in the small mammal house)had decided to start mating! XD I don’t know why I wasn’t allowed to stay! I see my cats do it all the time, and when I had male guinea pigs I saw it happen all the time! I took pictures and sent them to everyone I knew. What guinea pigs are into is none of your business. What I meant is that I used to have male and female guinea pigs and now I only have female ones and my first one, Fry, likes to get up on the others. Friolet(Fry-let). All of this is pointed out in most of the books about the making of Star Wars, including the guidebook to the 90s “The Magic of Myth” Smithsonian exhibit that I recently picked up at a library booksale. Ros and I are going to Kokon next week! Also I’m performing at the Renaissance Faire in my area again this year and things are stressful but also very exciting and I will in all likelihood get to shoot cannons! I want to live in a house like this someday. GRE conquered! That’s the first time I’ve ever done better on a math section than the verbal section of a test. Currently writing a story about how all of the hate in the world finally got so strong that it took the form of a virus that leaves the human body nothing more than skeletal remains, and how a man who somehow discovered a way to change his body into something non-biological so that he wouldn’t be able to get the virus, and also gained the ability to give his body bat-like appearance at will and who is traveling the area of infection in order to drive it out by killing those infected, which eventually led him to become insane for destroying the virus. Just so people know what not to copy from me. Thanks, Catwings! If ever I am tempted to write a story exactly like that, I promise to refrain. There are non-blur photographs of the surface of Pluto! There are photos where you can see features! I was just about to say something like that! I’m counting down the hours… unfortunately, it’s going to be 4:49 in the morning on Tuesday, so I may not be exactly awake during the actual closest approach… but I’m sure that there will be lots to read on the NASA website in the morning. HAVE YOU SEEN THE NEW GOOGLE DOODLE?! It’s not even very interesting or exciting. But for some reason I love it. What do you mean it’s not exciting? I find it very exciting indeed. Well, I meant that the Google doodle itself is not very exciting. It just shows New Horizons flying by Pluto. Now, if there had been this 2 minute long condensed animated history of Pluto and the entire mission… that would be interesting. Of course, I do find the new horizons mission VERY exciting. Just ask any member of my family. Or my dog, honestly. True. A complete animated history would’ve been cooler. I’m mostly just happy they put the heart shape on it. Ooh, they did? I didn’t notice. What about the whale? I gotta go check it out again. Lately I’ve been having weird moments of realizing that I am actually living my life for real, which sounds very odd, but I feel like up until now everything I’ve done has been framed as preparation for when I was finally being an adult, whatever that’s supposed to be. Not that I have any delusions that my current life situation is much of a step upwards towards complete sophistication (knowing me that’s unlikely, and if nothing else my apartment is more of a sideways sashay than a step up from a dorm room), but I am paying my bills with my own paycheck. I’m hundreds of miles away from people I knew before and I’m doing okay, and that’s something I guess. While exactly where I am is temporary, it’s weird to think that this general pattern is something that will be the template for the rest of my life. It’s weird reaching a point that I’ve been conditioned to prepare for since as far back as I can remember, but I’m not sure how much I ever expected to actually get here. I think you’re joking but my grandfather WILL NOT STOP talking about how I need to decide how to invest my Roth IRA (a graduation present from him, to be fair). I honestly have very few things that are lower priority in my life right now than the amount of interest it makes. 1. Set things up so it’s easy to tweak your IRA holdings online (you’ve probably already done this). 2. Let your grandfather pick the initial investments, once (he’s probably already done this). 3. Log on once a year on an easily remembered date (New Year’s Day, your birthday, Towel Day, etc.) to do routine maintenance. I think that at your stage of life, once a year (or twice, if you can stand it) is a good compromise between obsessive day-trading and utter neglect. every month or two I get the email from TD Ameritrade being like “your statement is ready to view” and every time I ignore it. Besides knowing that I make enough money to pay rent and buy groceries and still have a little left over right now, I am the most painfully clueless about anything money-related. hi MuseBlog! im in an airport! I have been in an airport for the last 10 or so hours. and will continue to be in this airport for at the very least 3 more. stay tuned! So, what are the advantages of living in an airport? After my 15th hour in the airport I can confirm that there are charging outlets here, and chairs to sit in, and moving sidewalks. there are also places with food, which they will give you if you give them money. also if you have to stay overnight they lay out cots and give you blankets. I’ve been able to spend time reading about the Leningrad symphony. some disadvantages include the lack of free wifi. at least I have cellular phone data. Oh man, I am so sorry. Have you played the moving sidewalk game? It’s where you find the weirdest pose you can think of and hold it while riding down the moving walkway. (Handstands recommended, with caution.) Sometimes you can get an innocent bystander/family member to video it for you. I did not get to play that, but I am now at my home airport waiting for a vehicle. I’ve never been so happy to see an airport terminal in my life! Robert, congratulations! It’s so engaging (unsurprisingly). I feel like this is the kind of science writing that gets people interested in science. Seeing you type unitalicized is jarring. I had to copy and paste it into Word and italicize it just to understand what you were saying. Update: at 108 tweets, it’s the second-most-tweeted Pluto story we’ve posted this week. Thanks to any MBers who may have helped! Nice work, it’s really cool to see that scan of the original article at the top. I HAVE JUST ACCEPTED A JOB AS AN ASSISTANT EDITOR AT A MAGAZINE IN NY!!!!!!! I’m going to be working as the assistant editor for Jewish Action, which is the magazine of the Orthodox Union (a massive organization that provides an “array of religious, youth, social action, educational, public policy and community development services, programs and activities.” Definition taken from their website.) It’s a quarterly magazine with a cover story, features and opinion pieces, regular columns, and some internal news scattered in. Think of something like Discover magazine, only instead of discussing science, it discusses topics relating to Jewish living. Their offices are down in the financial district, right near Bowling Green. As the assistant editor, it is essentially the responsibility of me and the editor to put the magazine together to be sent to the layout and printing departments. There’s also an editorial board that is involved in the conceptual stage. My responsibilities include contacting writers, editing/rejecting submissions, fact-checking articles, handling subscriptions, contacting galleries and photographers for photos, basic layout of articles in InDesign, proofing (and more proofing! ), updating the website, and posting on their Facebook page and twitter feed. The immediate task at hand – finding a place to live in Manhattan. Hm, maybe Pollyhymnia knows somebody who knows someplace good. Want me to ask? It looks like I found an apt, but I would be happy to get any info from Pollyhymnia in case this one falls through/for future reference. If you could ask her, I would definitely appreciate it. Nice! That sounds like a lot of fun! I would recommend living not in Manhattan, because it’s wicked expensive. So is everywhere, though. I’m currently trying to find a subletter for a room in my apartment, and I’m discovering that I strongly dislike being on either end of apartment hunting. Ugh, that’s horrible. I’m sorry about your guinea pig. Did anyone else watch the press conference about New Horizons on NASA TV today? It was… I hate to use this term, but just awesome hearing them talk about the mission and then unveiling the latest image of Pluto that’s come in so far. I can’t wait until Friday, when they finally compile every high-resolution bit into a complete image of the dwarf planet! It’s amazing to think that Pluto has gone from a strange blur out in the middle of the unknown to an unbelievably clear picture that can now be found pretty much anywhere with a WIFI signal. New Horizons may not be the first spacecraft to ever get this far out in space (the Voyagers already have a head start), but if you think about it… just over a century ago, the Wright Brothers made their first successful flight at Kitty Hawk. Now, we have space probes hurtling at – or at least it was on Tuesday – 14 kilometers per second. It’s just crazy to think of how far we’ve progressed. I wasn’t able to watch it, but I agree entirely. The mountains! The photos of the mountains on Pluto! OH MY CAKE OH MY CRUD OH MY KOKOPELLI! It has been a bad week for MBers’ pets. I’m sorry, GCA-DS. GAPAs, I noticed that the MuseMagKids website has a “Muse readers! This website will go offline at the end of July, but we want to stay in touch” notice. Is that page really shutting down? I don’t know, Cat’s Meow. Muse came under new ownership and management a couple of years ago, and the new folks don’t consult me anymore. One staff member has unofficially told me some dismaying news: Larry Gonick, the Muses’ cartoonist, is leaving the magazine. Larry confirms that it is so. I’m not sure whether they’ll hire someone else to replace him or just decide to stop publishing the magazine; it’s hard to imagine Muse without him. Clearly, major changes are afoot in any case. So I’m reading “Assassination Vacation” about ten years after all the hype when it came out. But it lives up to it very well. So, I know I never post on here anymore, but I had a few things to say! And I believe that now that I am 18, it is cool to say these things! The GAPAs can censor this all they want if it is not cool! First of all, my name is Luke Fowler! That’s cool! Now you know my name and also the fact that I’m going to St. Olaf College in Northfield, Minnesota next year! Even cooler! I would also like to say that I love you all, and my lack of time spent posting here does not reflect a lack of love for you people! You’re all the people who shaped me through my early preteen and teenage years. Even when I disagreed with you, you respected me. And we laughed together and loved together and it was great. Love you all. I don’t know why I felt the compulsion to say all these things (which, now that I look at them, are not very many things at all), but I am happy I wrote them down! Just know that whoever you are, you’re wonderful. Especially if you’re not feeling wonderful right now. You’re wonderful because you’re here, and this is a place for wonderful people. I can’t remember the name of it, but there’s a coffeeshop in Northfield that makes a fantastic Mexican mocha. I spent the day first remixing the The Martian trailer to refer to New Horizons, then reading The Martian. A day well spent, I think. Even if it was a little backwards. Can you post the remix trailer? GAPAs, what do you think? A delinkified link would be fine. POSOC, are you writing about Peter S. Beagle for the August thread? Because if not, I’ve just had an inspiration. I’ve been in a terrible creative slump lately, so go right ahead. You know, these don’t have to be terribly long. But we’ll give you a reprieve. I think learning how to do it will take me longer than actually doing it. I’ll have it ready for September. I’ve also got a thread drafted for some future month, but there’s no rush. Mini-Kokon! Ros drove a really long way just to socialize with me, what. Hey all! Unfortunately no pie as of yet. We had piroshky though, which is stuff in pastry so that counts for something? “Piroshki” is Russian for “little pies.” I’d say that counts. Hmph, it wasn’t just to socialize with you (but of course you were the best part). That is the noise I apparently make when complimented by GAPAs. Out loud, haha. And also when complimented by me, and also out loud. Happy Moon Landing Day! Moon pies for everyone! Does anyone else know the band “Public Service Broadcasting”? They remix old newsreels (roughly ~30s-60s) with a backing track to make music videos. Their Apollo 11 track, “Go!” is glorious. Hey guys, I need your advice on something. I want to invite my friend over to watch Sharknado 3 tomorrow, and my dad doesn’t have a problem with inviting somebody over, but thinks that this particular friend has probably socially moved on since we aren’t at ﻿the same school anymore. It’s true that she’s been too busy to do things together for a while, but we still text sometimes and like each other’s posts on social media. I don’t want to bother her if she doesn’t want to be friends anymore, but I also don’t want to end our friendship by mistakenly thinking she’s avoiding me. I could text her and ask if she wants to come over tomorrow (﻿the worst that could happen is her saying no), but my dad would probably be disappointed in me if I ignored his advice. What should I do? It seems to me that “you guys don’t hang out as much anymore” seems like a lousy reason to not hang out. Counterproductive, even. I mean, your dad doesn’t really know what your friend is thinking, and neither do you. You should still go for it if you want to see this friend, but if he’s right then you might get an “I told you so”. Otherwise, I wouldn’t think he’s going to be terribly disappointed if you don’t take it (or idk, you know him better than I do, but it seems unlikely) — I think he’s just trying to prevent you from getting hurt if this friend has in fact moved on, so it’s up to you whether you want to take that risk. Just tell him you want to at least try to reach out to her and see what happens. Update: I convinced my dad to let me text my friend and she’s coming over tomorrow. Band is happening. Rookie camp is this week, meaning I help teach all our section’s freshmen to march. We have five baritone freshmen, one of whom is my sister. Another one seems to hate everything. Another is actually a sophomore and just moved schools. Watching them hold up their baritones for the first time is a very uncomfortable vicarious suffering. There’s also a baritone solo this year, and since the other first baritones are at governors school til next week, I get to play that for a while. Fun. It’s exhausting and also I work every morning that I’m not at band. And I have a piano lesson tomorrow and also maybe a saxophone lesson. My life is all busy now that band has started, I’ve paused habitrpg and don’t know when I’ll be able to turn it back on. I guess it’s good I’m out of the house (and I can drive myself places too now, which is nice) because when left to my own devices I say I’m going to practice and compose music and clean my room but I’m quite unproductive. I’d like to get some composition projects finished but I’ll wait for after band camp to see about that. I’ve been trying my hand at songwriting for my garage band but nothing’s really come together yet. it’s midnight. I’m very tired. So, if I make a wish at 1:11, will I only get 3/4 of my wish? I am proud to say that I have assembled a couch. It’s really comfy, and also turns into a bed. I think I’m adulting successfully! Give the woman a pie! Bridgette LeMoo is still my favorite character. French, Only Sane Heifer who stays on loan to the FFFBI by choice despite getting offers from their less-chaotic competitors and being able to go back to InterPoultry if she wanted, linguistics expert who speaks “over 22 languages” (and learned three over the course of a weekend), learned to be an art expert in another weekend, possibly a working mother (she refers to modern art as looking “like my calf drew it”), motorcyclist and scuba diver (despite being a cow). Bridgette LeMoo is better than you. So nice to see those names on MuseBlog again. Enjoy your trip! Do you live somewhere warm? I have an avocado plant that I started growing from a pit maybe… nine or ten years ago? And it’s this cute little guy who really wants to be a tree but it’s not warm enough here to plant it outside, so it sits in the kitchen growing tall and spindly trying to get to the light. Downstate New York. Our summer is certainly warm enough, but if it turns into a potted plant, it’ll have to spend the winter inside. Still, we have some big pots– Mom had a palm tree in a pot in the living room for years. Have you read this article from the New Yorker about the inevitable Cascadia earthquake??? It is scientific, grim, and utterly poetic. It’s rare that I fall in love with science articles aimed at the general public anymore, but wow did this one hit me in the head and the heart. There’s a corresponding (finished) AMA up on reddit, too! As a Northwest resident since the age of nine they like to bring The Big One up periodically to scare us, possibly into behaving. I’m glad the writing amused you, because honestly I’m a little tired of seeing articles going WOE THE APOCALPYSE IS UPON US when geological events are about as predictable as the weather in two months. I mean, I’m a geologist, and thus operate on a geologic timescale. I’ve been panicking about the state of the Colorado river since I found out about the situation 6 years ago, and want to physically shake everyone out here who’s only just now going “oh maybe that’s gonna be a problem.” So like, “IMMINENT DISASTER” for me is a span of anything less than “probably occurring sometime in the next 200 years”, because really, when it comes to dates I like to be able to estimate on a scale where I can be off by a million years and still have it be considered “reasonably accurate”. And when it comes to the weather, I prefer Milankovitch-cycle scale events to the weekly meteorologic forecast! Hailing from the Oregon coast, I beg to differ. I agree that the article may have exaggerated some details for effect (power outages, however severe, shouldn’t classify everything west of I-5 as “toast”, for example). However, the statistic that there is an approximately 1/3 chance of “the big one” happening within the next 50 years is all too real. And that is just the prediction for the most devastating earthquake possible, as well. There is an even higher chance of another, medium sized earthquake happening in the near future that would also claim many lives and cost multi-digits in property damages, etc. Additionally, one must remember that the “every 250 years” (or however often, I can’t remember exactly) is simply an average. An estimate. It could happen in 500 or 1000 years. Or it could happen 50 to 100 years after the last quake. Of course, I’m still talking about “the big one”, and all of this was already factored into the original 1/3 chance of another occurrence in the next 50 years (which also happens to be an estimate, so…). Both my parents happen to work at an OSU marine science facility on the coast, and they actually know some people who study and research earthquakes, tsunamis, and the engineering involved, and they and others (I believe one specific Seattle newspaper is an example) are somewhat aggravated that it actually took this long to finally get people to LISTEN to what they’ve been shouting for years. My own family has been keeping an earthquake supply kit in our garage for as long as I can remember, and in the past year or two, my mom has really been more serious about it. We’ve been saving up filtered tap water in old milk jugs since around 2013, now, along with lots of rice and macaroni and canned food and tiny pocket camp stoves and thermal blankets and… I can’t even remember everything we have in there. In fact, just this weekend I helped bring down our sleeping bags and other camping stuff from the attic for easier access after a disaster, and last week we ordered a giant box to put (probably literally) a ton of other stuff in and keep outside. My mom has even seriously thought of buying a shed to everything else in, too. With all this, it makes me feel a little safer to sit around at home, and the other building that I spend most of my time in, my school, is also pre try ideal. My school is actually an evacuation DESTINATION for others fleeing from their homes (it’s located at the top of a pretty good slope, same as my own house) and has two full sized shipping containers (you know, the ones on ships and trucks and trains) FULL with emergency supplies for kids at the school and everyone else who escapes up the hill. My parents, however, are at the mercy of older buildings, liquefaction, and the fact that they are totally in the inundation zone and the only evacuation route is to a tiny little hill hopefully barely high enough that is supposed to be enough for everyone in the area to run to stay for a prolonged period of time. Fun. Ok, I spent way too long picking out these letters on my tiny phone (that explains the many typos that are probably scattered across this deluge – ha ha get it? Deluge.) so I’m going to go to bed and try to forget about this whole earthquake thing because I’m kind of freaking out now. In California, we were always told to keep a few things in our cars, too, in case a big earthquake struck while we were driving around. I drove with hiking boots in the back most of the time I was there. After the Loma Prieta earthquake hit, I slept in my shoes for a couple of nights in case it turned out to be a foreshock to another earthquake big enough to break the windows. (Rosanne and I were in Santa Cruz, 10 miles from the epicenter.) Being in a major earthquake does make an impression on you. My dad experienced an earthquake when he went to college in San Diego, but that was in the 70s, before Loma Prieta. Basically what I meant is that yes, it’s important to be prepared for earthquakes when your city is built on a fault line, especially when much of our waterfront is at risk of sliding into the ocean. That said, none of these articles focus on preparedness, they focus on IMPENDING DOOM and it irritates me. But it looks like the author has written a follow-up article addressing preparations in yesterday’s “New Yorker” in response to so many people asking how to prepare. Wow, thanks for sharing that, Jade. The scientific story is fascinating, especially the connection of the drowned forest and the local oral histories with the “orphan tsunami” in Japan… but those descriptions of the possible impact are horrible. I think if there’s one thing that I really took away from the class on natural disasters that I took in the fall semester, it’s frustration that there isn’t enough preparation for things like this. We get earthquakes in Britain. Very small ones. There have been fatalities – I think about a dozen in the past thousand years. I’ve experienced two. When the last one occurred, I was working in a factory, building high voltage power supplies. Things rumbled and shook mildly for a minute or so (I thought they’d started some heavy machinery upstairs), the fire alarms wne off, and we all went outside to wait for things to calm down. Then we all went back in for a cuppa. Not the most dramatic event. Update from my last post (July 15th? I really need to come here more often): Likely apartment found! Hoping to get the lease business all finished up tomorrow. This has been two and a half weeks of answering Facebook posts, texting friends, etc. I will be so supremely happy when this is all finally settled and I know for sure that I have a roof over my head (granted, I have offers from two family friends to take me on temporarily should nothing come through, but hopefully it will not come to that). Yup, as Fiddler pointed out, apts in Manhattan are ridiculously expensive. Last week, when I was feeling desperate, I looked into studio apts and they were really not in my price range. So to keep costs down, I’m going to be splitting a two bedroom with three other girls (two per room). The neighborhood itself – Washington Heights – is not the most expensive neighborhood on the island, so that also helps. My commute will be fun, however, as I will be traversing the length of the island twice a day. But oh well. The neighborhood is nice and I have friends who live up there already. Well, well. During some insomnia, I suddenly recalled a certain forum that I used to visit somewhat fanatically. Had some trouble recalling the url – but here we are. I joined in 2005 as Bellatrix Lestrange, eventually with more than a few other aliases – you old hats might not remember me, but man, I may or may not have teared up a little to see names that I remember still writing here. This place sure has lasted. Good to see you again! How has life been treating you? Let’s say this straight out: apt hunting stinks. So…the looks-like-it-will-work-out-yay! apt I posted about yesterday just fell through, for the simple reason that the landlord is not stupid. He will only allow folks with income/parents who will act as guarantors to sign the lease, as he wants to make sure that he gets the rent $. And he also wants at least 3 people to sign. And as the two other girls currently wishing to stay in the apt are students with no income…kaboom. If we manage to find another girl with a job/parents who will sign to get in on this, and have the parents of one of the girls currently in the apt to sign, they we can still go through with this. Of course, the lease is up at the end of this week, and it’s only a 1 year lease, so if no one is found this week, the apt is up for grabs. The good news: the safety net of family friends who will give me a roof while I’m still looking. I so so so massively wish that I could just find a little studio somewhere and not have to worry about all this, but as far as I can see, the studios are really out of my price range. Agreed, agreed, agreed re: apartment hunting. I don’t know what your price range is but you may want to consider the outer boroughs – it sounds like you’ve been looking exclusively in Manhattan and it also sounds to me like large swaths of Brooklyn are going to be closer to your job than Washington Heights is. It is true that Brooklyn would be a lot closer to where I will be working. I’ve been looking at Brooklyn a bit today, using Zillow. I think I’ve found some studios in my price range, in a good neighborhood (according to the NYC crime map). General question to all – has anyone used Zillow in apt hunting, and has it been reliable? Movie Zaphod is such a gift you guys. Had a dentist appointment earlier today (although it’s a different story, my gums are still sore) and on the way back we stopped at a rummage sale and found some classic National Geographic tapes. I’m watching the ones on ancient civilization now, and find myself quite fascinated. The bog mummies are my current favorite, especially for the mystery of their deaths, since it seems that they were quite violent. i finished grad school (yay!) and am still looking for a full-time job (boo), but i am working part-time in a public library (yay!) and i’ve been doing a really cool leadership program/grant project/something-or-other? through the state library (double yay!). my focus is on digitization/digital preservation/digital libraries and a lot more of those jobs are popping up recently so fingers crossed. i’m still with the same guy from four years ago (oh god we’re old) – he just finished the bar exam and has a job lined up as a patent attorney. we’re going to iceland and scotland in a couple weeks as our “yay we both survived grad school” trip! i’m hoping we’ll be able to catch the northern lights since he’s never seen them, but i’m not sure if it will get dark enough while we’re there. right now i’m really just savoring all the free time i have – it’s the first time i haven’t been in school for the past 18 years. (i’ve been doing some stuff on codeacademy but ssshhh that doesn’t count). lots of videogames, lots of reading, lots of naps!